This was a total master bathroom makeover to create a more gracious one level master bath that feels clean, inviting and spa like. Three dimensional drawings were done to help the client envision the final result and Wingpoint Design helped to find sub-contractors, compare pricing, create a schedule and make the process easier and more streamlined. 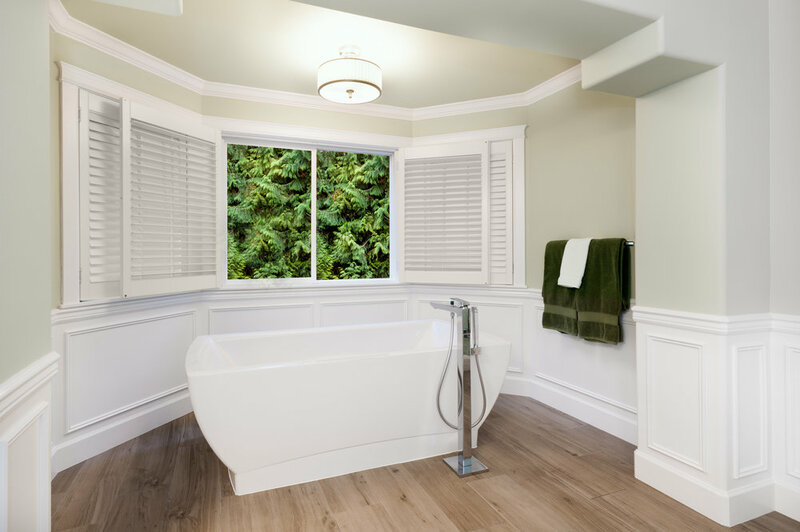 This project incorporates the client’s favorite color palette of soft greens and white painted custom cabinetry and wainscot to brighten the bath that looks out into the greenery beyond. A gentle radiant floor heating system was installed under the floor which hides the heat source. It's quiet, eliminates the distribution of dust and particulates and is typically 3-5 degrees more efficient than other systems.